Festival of Sails an annual event held in Mumbai, India, is the collective voice of the city sailors and civilian sailing clubs supported by RBYC, INWTC, AYN, BSA and CSC. Boat Classes include 420, 470, Laser (Standard, Radial, 4.7s), Seabird, Lightning, J24s, etc. Activities include Racing, Match Racing, Sailing, and Yachting. Army Yachting Node’s (AYN) Dharmender Singh had a fantastic final two races as he lifted the Standard Laser Class title during the Coastal National Sailing Championship at the Festival of Sails at the South of Oyster Rock, Colaba on Tuesday. Dharmender, who had lost his lead to compatriot Kuldeep Pandey on Monday, gathered his lost form to finish second and first in the race nine and ten to win the championship with 26 points. Pandey on the other hand had a disaster final day to finish seventh and sixth in the last two races. He still did enough to seal second spot with 28 points ahead of Gajender Singh, who finished with 39 points. All the top honours in Standard Class went to AYN’s sailors. In the Radial Class category, it was again AYN’s Ramesh Kumar who was a run-away winner. Even though he didn’t have the best of the last two races, he maintained consistency in his performance to win the championship with a gap of nine points. Ramesh finished second and eight in the last two races. Second place was taken by Bikram Mohapatra, who finished with 29 points. Third place went to Shekhar Singh Yadav, who accumulated 44 points. In the 4.7 Class category, Chintan Chatbar overcame tough resistance from Upamanyu Dutta, Vir Menon and Vishnu Saravanan to win the championship by six points. He finished first and third in the last two races to accumulate 22 points and win the title. There was a tie for second place between Upamanyu Dutta and Vir Menon but they were separated with a better overall finish. It was a big heart-break for Vishnu Saravanan, who was leader till Monday, as he finished point behind the duo with 29 points. Later in the day, the event folded up with Away All Sails which consisted more than 100 boats from various classes. It was rare and a picturesque moment to see such huge number of sails sailing across on Mumbai waters. There were huge A-Class boats followed by some Fixed Keel boats, J24s, Seabirds, Lightnings, 420s, 470s, Hobie Cats, Optimists, Lasers and many more. All the participants were given medals and the winners were handed in the prize distribution ceremony held at the Royal Bombay Yacht Club. This was followed by a dinner and dance in honour of the winners, and the entire diaspora of the sailing community represented by ages that spanned pre-teens to Octogenarians, participating clubs across the country with close to 300 sailors, Coaches, Jury, Protest Committee members, organisers, and their kith and kin. Standard Class: 1) Dharmender Singh – 26 points 2) Kuldeep Kumar Pandey – 28 points 3) Gajender Singh – 39 points 4) Muzahid Khan – 41 points 5) Gitesh – 50 points. Radial Class: 1) Ramesh Kumar – 20 points 2) Bikram Mohapatra – 29 points 3) Shekhar Siingh Yadav – 44 points 4) Xexes Bamboat – 47 points 5) Sharif Khan 58 points. 4.7 Class: 1) Chintan Chatbar – 22 points 2) Upamanyu Dutta - 28 points 3) Vir Menon – 28 points 4) Vishnu Saravanan – 29 points 5) Ektha Yadav – 60 points. Dharmender Singh in the overall point’s tally of the Standard Laser Class during the Coastal National Sailing Championship at the Festival of Sails, held South of Oyster Rock, Colaba. Dharmender Singh had a mixed day, as he fared a lowly eighth in the morning race. In the first of the afternoon races his form again slumped as he finished at the back of the pack. He countered though with a second place finish in the eighth race. Even though he made a good showing in the afternoon, it wasn’t good enough to maintain his spot at the top of the table as Pandey took his place who had finished fourth in the morning race and second in the seventh race. He bettered his performance in the last race of the day as he finished first to extend his lead at the top of the table. With two races remaining, it would be interesting to see who wins the title as there is a close fight between top three leaders, which also includes Muzahid Khan and BK Rout. The latter had an outstanding day as he won two of the three races held on Monday. In the Radial Class category, Ramesh Kumar too saw his lead being cut down drastically. After bagging top two finishes in the first five races, the Army Yachting Node’s sailor finished second in the morning race but his form slumped dramatically, as he finished out of the top three races in the afternoon races. In the seventh race he finished fourth while in the eighth he finished a disappointing sixth. The 4.7 Class, has thus far has seen a very close battle between Vishnu Saravanan, Upamanyu Datta and Vir Menon for top honours. In the sixth race held in the morning, Vishnu Saravanan finished ahead of Tarun Bhatia and Ravindhar Murali, while in the seventh race Chintan Chatbar, Aryaman Dutta Vishnu Saravanan finished ahead of everyone. In the last race of the day, Vir Menon finished first while Chintan Chatbar and Ektha Yadav finished second and third respectively. Sixth race: 1) BK Rout 2) Gajender Singh 3) Gaurav Randhawa 4) Kuldeep Pandey 5) Virender Singh. Seventh race: 1) Bk Rout 2) Kuldeep Pandey 3) Naveen Kumar 4) Muzahid Khan 5) Gajender Singh. Sixth Race: 1) Shekhar Singh Yadav 2) Ramesh Kumar 3) Bikram Mohapatra 4) Amandeep Singh 5) Nanda Raikar. Sixth Race: 1) Vishnu Saravanan 2) Tarun Bhatia 3) Ravindhar Murali 4) Vir Menon 5) Nicholas Ptrick. Seventh Race: 1) Chintan Chatbar 2) Aryaman Dutta 3) Vishnu Saravanan 4) Ramya Saravanan 5) Upamanyu Dutta. Indian Army Yachting Node’s (AYN) Dharmendra Singh rounded off an outstanding day, as he won race three and five of the Standard Laser Class during the Coastal National Sailing Championship at the Festival of Sails held at the South of Oyster Rock, Colaba on Sunday. Gajendra Singh at the top of the table. After winning the Race 3 held in the morning, the Army man struggled in afternoon’s first race as he finished at the back of the pack. He didn’t let the disappointment get the better of him as he finished ahead of everyone with a big margin. His training team-mate finished behind him and he was closely followed by Muzahid Khan in third place. Ramesh Kumar dominated as he won 2 out of 3 races on Sunday. Bikram Mohapatra and Sharif Khan. In the afternoon race, though, he lost his first place to Xerxes Bamboat, who had an outstanding race after taking the lead at the start of the race. Third place went to Deelip Kumar. In the last race of the day, he got the revenge and finished ahead of Xerxes to take the top spot. In the 4.7 Class, it was a close fight between Upamanyu Dutta, Chintan Chatbar and Vir Menon as the trio won the three races that were held on Sunday. In the morning race, Dutta was followed by Nethra Kumanan and Chintan Chatbar to add some spice to the overall points tally. In the afternoon races, Chintan finished ahead of Vir Menon and Dutta to push him down the table. It got worse for Dutta as he struggled into the winds to go at the back of the pack and hand the win to Vir Menon. Second place went to Vishnu Saravanan and Ekta Yadav. Race Committee Vessel Keeping An Eagle Eye. Those Who Give Method to Madness, Laying Course, Starting and Ending Races, Declaring Winners and Results. Third race: 1) Dharmender Singh, 2) BK Rout, 3) Kuldeep Pandey, 4) M Naveen Kumar, 5) Gitesh. Fourth race: 1) Kuldeep Pandey, 2) Gaurav Randhawa 3) M Naveen Kumar 4) Muzahid Khan 5) Gurjit Singh. Third race: 1) Ramesh Kumar 2) Bikram Mohapatra 3) Sharif Khan 4) Sandeep Kapoor, 5) Shekhar Singh Yadav. Fourth race: 1) Xerxes Bamboat 2) Ramesh Kumar 3) Deelip Kumar 4) 704 5) Sandeep Kapoor. Third race: 1) Upamanyu Dutta 2) Nethra Kumanan 3) Chintan Chatbar 4) Vishnu Saravanan 5) Avanti Menon. Fourth Race: 1) Chintan Chatbar 2) Vir Menon 3) Upamanyu Dutta 4) Vishnu Saravanan 5) Ravindhar Murali. After winning the 420 Dingy Class, Upamanyu Dutta carried on his good form by winning the first race of the 4.7 Laser Class at the Festival of Sails held at the South of Oyster Rock, Colaba on Saturday. The 16-year-old was simply unbeatable as he finished way ahead of others to completely dominate the race. The youngster had a slow start but capitalised once he got use to the windy conditions. At the half-way mark, he took the lead and didn’t let anyone get ahead of him. At the finish line, he extended a huge lead to finish first. He was followed by Vishnu Saravanan and Vir Menon, who finished in second and third position respectively. The surprise fourth position was bagged by Vir’s younger sister Avanti, who is no more than 13 years of age. All the Classes including 4.7 will see in total ten races and the contestant who accumulates least number of points will lift the championship in the category. It would be interesting to see if he can maintain his consistency in the upcoming races as well. In the Standard Laser Class, Gajender Singh finished ahead of team-mate Dharmender Singh to start his campaign on a bright note. They were closely followed by Kuldeep Pandey in the third place. The trio made a clean sweep to keep the Army Yatching Node (AYN) flag flying high. In the Radial Laser Class, AYN’s Ramesh Kumar capitalized on a good start to finish first. He was followed by Nanda Raikwar and Bikram Mohapatra. Interestingly, Nanda is the only female participant in the category. The entire Laser Class saw as many as 77 Sailors participating from all over India. This has been a rare picture in Mumbai’s water and the organizers were overwhelmed with the response. Standard Class: 1) Gajendra Singh, 2) Dharmender Singh, 3) Kuldeep Pandey, 4) Gitesh, 5) Virender Singh. Radial Class: 1) Ramesh Kumar 2) Nanda Raikwar 3) Bikram Mohapatra, 4) Abhimanyu Panwar, Deelip Kumar. The Laser Cup being held under the auspices of the Festival of Sails begins in Bombay Harbour tomorrow, Saturday, 22nd December. Bombay has seen some lovely weather and reasonably favourable winds, the skies have been generally amiable too. It promises to be interesting competition in all the three classes including Laser Standard, Laser Radial and Laser 4.7. Among the favourites for Laser Standard are Dharmendra and Gajendra, in the Radial, close competition is expected between Ramesh, Xerxes and Salil. In the Laser 4.7, we predict tough competition between current National Champion Vir Menon, Upamanyu Datta, Vishnu and Ekta. Avanti Menon, Youngest Girl Sailor, all of 13 years. Among sailors of notable talent seen practicing hard was Avanti Menon the youngest girl sailor in the race, all of thirteen years old. Avanti first starting sailing at 7 years. She has earlier sailed in the Hong Kong waters with winds upwards of 15 knots as helm on an Optimist. Vir Menon, Avanti Menon and their father Mr. Menon make a great sailing family on the waters together. Ekta Yadav all of 17 years old is again a promising sailor on the Bombay waters. Sailing since 2008, she has been National Champion for Optimist in Girls Category for 2 years, and also won the Silver Medal in Open Category. She has also sailed the 420 Class in Girls Category and won the Gold Medal in the National Championship in 2011. Upamanyu Datta, a student of Bombay International school has won the Junior 420 Class National Championship earlier this year. He won his first National Championship in the Optimist Class at the age of 11 years. He also won the Hyderabad Monsoon Regatta, three years in succession. 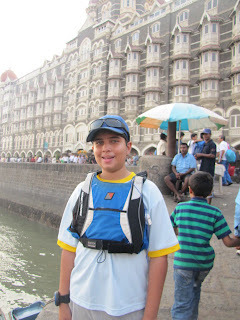 He along with his crew Hussain Arsiwalla, both winners of the Spring Chicken Cup for the Junior Under Nineteen Trophy for the 420 Class Sailing National Championship 2012. Both are preparing to represent India in the upcoming Asian Games in South Korea. Hussain Arsiwalla, Energy on the Water! We met both Upamanyu and Hussain on the waters during practice who thought that it was going to be a tough competition. All in all the Laser Cup promises to be an exciting event given the effort and practice put in by the contestants. We look forward to a nail biting finish! R Mahesh defeated Ayaz Sheikh in a one-sided final of the Match Racing Championship during the Festival of Sails at the south of Oyster Rock, Colaba on Wednesday. Mahesh took the early lead and kept attacking Ayaz Shaikh with some good sailing skills. He showed his experience and why he is regarded so highly in the sailing circles. In the later half of the race, Sheikh made some ground and was on Mahesh’s tail constantly. But some quick thinking at the end, made sure Mahesh finish ahead and also lift the championship. In the Morning Race, Upamanyu Hussain came 1st. In 2nd race they were lying second but Sanjeev Chauhan was leading, he was first until the auto bailer opened and Hussain dropped to finish 4th. Afternoon race light winds the breeze set in fairly late, 2 boats were over the line at the start of the race, one of which was Upamanyu and Hussain, who rerounded to start again. In the 420s 1st Race, while Pankaj Kumar #50915 rounded first with the husband and wife team rounding 2nd, their position kept interchanging in the race. The 5th 420 race ended with husband wife couple getting their first gun and Pankaj Kumar and Anshuman Acharya finishing second. It was a close fight for 3rd position with #5091 finishing 3rd just seconds before Upmanyu and Hussain. In third place, Atul Sinha finished ahead of Muthu Rajan to grab the third place in the championship. Earlier in the day, R Mahesh defeated Atul Sinha in the semi-final while Ayaz Sheikh overcame stiff competition from Muthu Rajan. In the afternoon races, Sanjeev-Tulsi Chauhan finished first while Pankaj Kumar-Anshuman Acharaya and Ekta Yadav-Asif Shaikh finished second and third. In the 470 dingy class, Chandra Shekhar-Kamalesh Patel won the race Ashis Patel-Nirna Pandit and Kiran Kumar-Harpreet Singh finished closely second and third. Match Racing: Final: R Mahesh defeated Ayaz Sheikh. Third place: Ayaz Sheikh. 420 class: Afternoon race: Sanjeev-Tulsi Chauhan, Pankaj Kumar-Anshuman Acharaya, Ekta Yadav-Asif Shaikh. 470 Class : afternoon race: Chandra Shekhar-Kamalesh Patel, Ashis Patel-Saran Raj, Kiran Kumar-Harpreet Sinha. Day One. Perfect Sailing Conditions!